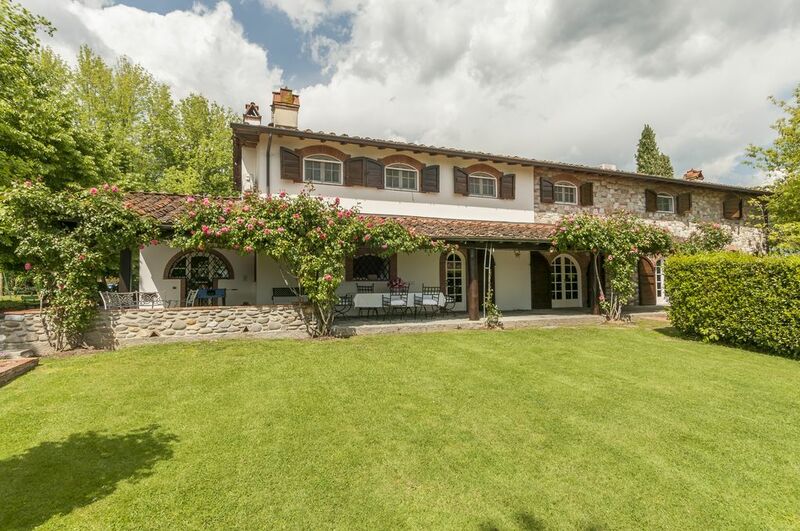 Independent Villa (350m^2) fully immersed in the typical Tuscany countryside, near from the most important historical centers like Lucca, Pisa and Florence. My name is Giuseppe Attilieni. I live in Lucca and I like very much to travel. My passion for tourism has completely involved me since 2008, and now I am working full time both as a property manager and property owner.I am also the owner of a company specialized in tourist services which relies on the collaboration of skilled suppliers ,so I can fulfill the following requests of my guests : - Tuscan cooking classes - Transfers from/to Pisa and Florence airports - Wine tasting tours - Guided tours of Lucca, Florence, Siena, Pisa and 5 terre I hope to have the opportunity to meet you and make your holiday a wonderful Tuscan experience. Bathroom1, 2 and 3 are on the first floor near the bedrooms, bathroom 4 is on the ground floor near the living room they are spacious and very well refined: all the bathrooms are finished with beautiful hand made ceramic materials and local marble. Bathroom 5 is in the taverna floor. We had an amazing time at Villa Stefania. There were 9 of us - four adults and 5 children. The house was very large and comfortable, and the grounds and view were absolutely beautiful. The house was conveniently located and well stocked with everything we needed for a comfortable stay. Giuseppe was a wonderful host, and gave excellent restaurant and activity recommendations. Giuseppe arranged for us to have an authentic cooking class at the villa - the food was incredible, and we all had so much fun learning about the cuisine and cooking the food. We would definitely recommend this property, and hope to stay there again soon! There is a lot to like about Villa Stefania. The outdoor area is very large, with gorgeous views and beautifully kept grounds. There are several shady dining areas outside and since the weather was lovely, we ate outside all the time. The pool area is stunning, very large and plenty of room for everyone to have fun. The house of flowers was a useful addition because it had an extra fridge which was necessary for all those extra bottles of wine. The house itself is very large and was very clean on arrival. All bedrooms had aircon apart from the lower ground floor but that was quite cool anyway. It would have been useful to have separate pool towels rather than having to use the same towels that were for use in the bathrooms. The kitchen although charming and rustic, was a bit of a challenge as there was a huge lack of power sockets for the amount of small appliances and there was a lack of large glasses. However after a call to Giuseppe he arranged a quick delivery of glasses to the villa! The villa is in a convenient spot for Lucca and Giuseppe recommended a lovely restaurant in Montecarlo which we visited. We also had a dinner catered at the villa one evening and this was very special, we all enjoyed it a lot. Antonio, Giuseppe's father, made us a lovely cake which we really enjoyed and this was much appreciated. Overall, we all really loved our stay in Tuscany, the outdoors of the villa cannot be faulted, Giuseppe was very easy to contact and responded immediately to any emails or requests. I'm very happy to know that you enjoyed and have spent a nice holiday at Villa Stefania.Also the advices are much appreciated: as regards the equipment of the kitchen, at checkin we always say to our guests that, in case something is missed, to let us know and that, if we can, we will provide immediately. Unfortunately it is very difficult to check all the equipment every time, especially when we have the check in the same day of the checkout, as it usually happens. As for towels, we already provide one large and one medium size for each of our guests, without additional cost, and we do, for free, a complete change of bed linen and towels for stays of 2 weeks and more. Providing specific pool towels could be a new service upon request for a fee: we are taking in consideration the hypothesis. The villa is stunning ! Gorgeous winding driveway up a hill to the villa you know you are going to get the Tuscan views that you dream of.The villa is large and spacious and old Tuscan style with amazing beams and brick ceilings. We were a group of 9 people from Scotland and the States meeting for a family reunion and there was more than enough space for us all.Everyone slept amazing and the beds were comfortable.The grounds and pool house were beyond our dreams so well kept and the pool is huge and so much fun after a day in Lucca which is about 20-30 mins in a taxi . Giuseppe was so helpful with taxis and always very responsive to any questions we asked. I didn’t have luggage for nearly 3 days and he was willing to help by calling them, I had given them his cell number and he arrived with the guys st the villa to show them where to go once they had called him. He arranged our airport transfers and arranged an amazing wine tour for us. The drivers were so nice and spot on time anytime we used them.We also got him to book us a private chef for my daughters birthday, Alessandra was great and took the time with my daughter who has special needs to show her how to make pasta , it was amazing ! We stayed at this beautiful villa in June 2018. From the start Giuseppe was very helpful, and this was extremely useful in being able to plan our holiday. The villa is perfectly placed to explore Lucca & Florence, and also close to the coast & beautiful beaches. The villa & grounds are spacious & immaculately looked after. We had a cake baked for us on Sunday which was mouthwatering & delicious. We had an Italian lady come in during the week to give an Italian cooking lesson. This was fun & informative, we all now feel brave enough to try cooking our own pasta! We were 7 adults & a baby of 10 months, spread over 4 generations. The villa suited us all including my dad who isn't very mobile. We loved our stay here & would happily recommend to anyone looking for a relaxing holiday in Tuscany. We would certainly love to return, and thank you to Giuseppe for having us to stay. Beautiful villa in the Tuscan hills! Fantastic family holiday in this beautiful spacious villa! Lovely surroundings with lots of space for all ten of us! Our four grandchildren lived in the pool which the adults thoroughly enjoyed too as we were in the middle of a heatwave!! Guiseppe the owner was very helpful and informative and his father who lived nearby made us two delicious cakes during our visit which were a great hit with us all! We had a Tuscan cookery class in the villa which was brilliant fun and thoroughly enjoyed by the adults in the group! We also had a personal chef one evening to celebrate my birthday! This was amazing! The table was set beautifully, the five course meal was fantastic with several bottles of wine included and all in a truly relaxing atmosphere in beautiful surroundings! Would recommend to anyone! All in all a really wonderful holiday in a truly gorgeous place! Fabulous old farmhouse, swimming pool, hot tub and gardens. My family and I had a wonderful holiday there. Giuseppe and his father could not have been more hospitable, Giuseppe's father made us two gorgeous cakes, which was so kind. The views from the farmhouse were amazing. I would definitely recommend this place and we would all love to stay there in the future. Giuseppe was always so helpful in answering any questions. Thank you Giuseppe. Only minutes from Lucca's historical centre, Montecarlo village on the road of the wine and Montecatini thermal centre. 30 min. from Versilia's beaches. Near to Pisa, Firenze, and Chianti shire, two hours from Siena, Montalcino and San Gimignano.